Savill Bay and Fitzroy Bay in Pelorus Sound, Marlborough Sounds. Game Point and Mt Shewell (775m) above. Maud Island far right. 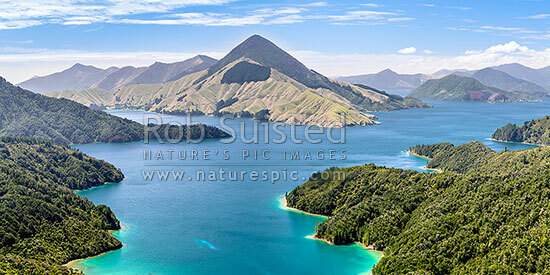 Panorama, Marlborough Sounds, Marlborough District, Marlborough Region, New Zealand (NZ), stock photo.